District 1 – Both Basehor-Linwood and Tonganoxie have clinched the playoff spots out of District 1. The Bobcats and Chieftains will meet this week in Tonganoxie to decide the district championship. The game carries enough significance to be voted on by the fans as the Kpreps statewide Game of the Week. Either way these two teams will have a challenge in the first round of the playoffs. The winner of Friday’s game will likely host No. 3 De Soto, while the loser will likely travel to No. 1 Bishop Miege. District 2 – Top-ranked Bishop Miege has clinched at least a playoff spot. Even if the Stags stumble this week, they can finish no worse than in the top two in district margin points. De Soto can clinch the runner-up spot with a win over Eudora. Spring Hill and Eudora still have outside shots at the second playoff spot, but each will need help. District 3 – Fort Scott has clinched the district championship with wins over Louisburg and Paola. The winner of the Paola game at Louisburg will advance to the playoffs as the district runner-up. 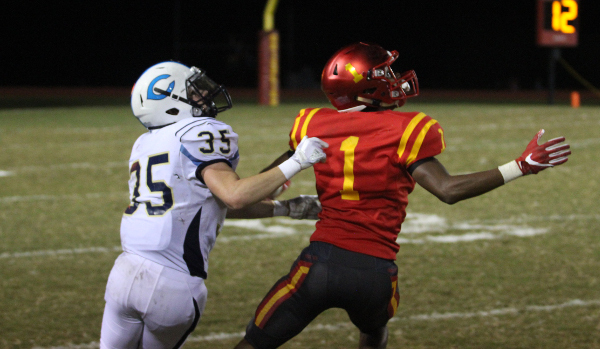 District 4 – Labette County has clinched a playoff spot as even with a 21-point loss to Coffeyville and a Chanute win, the Grizzlies would finish in the top two in terms of district margin points. Chanute qualifies for the playoffs with a win over Indy and a Coffeyville loss. Coffeyville advances with a win over Labette, but can also get in with a loss and an Indy win over Chanute. Independence has been eliminated. Even if the Bulldogs beat Chanute and Coffeyville loses to Labette, Indy cannot finish in the top two of points margin. District 5 – Mulvane has clinched the district title with wins over Wellington and Ulysses. Ulysses makes the long trip to Wellington this week with the winner qualifying as the district runner-up. District 6 – Maize South and Andover Central have clinched the two playoff spots out of District 6. The Mavericks and Jaguars will meet this week in Andover with the winner advancing as the district champion and the loser traveling to Mulvane in the first round of the 4A-I playoffs. District 7 – Andale can clinch the district championship with a home win over El Dorado. Meanwhile, El Dorado can steal a playoff spot with at least a 16-point win over Andale. Buhler can secure a playoff spot with at least a 7-point victory over winless Circle. Circle has been eliminated. Even if the T-Birds beat Buhler and El Dorado loses to Andale, Circle cannot finish in the top two of points margin. District 8 – McPherson has clinched the district title by virtue of wins over Hays and Wamego. Hays will host Wamego this week with the winner advancing to the postseason as the district runner-up. District 1 – Topeka Hayden has already clinched the championship with wins over Santa Fe Trail and Holton. Holton and Santa Fe Trail will play on Thursday night with the winner advancing to the playoffs as the district runner-up. District 2 – Baldwin and Prairie View will meet this week in Baldwin to decide the district championship. The winner advances as the district champion, while the loser will travel to Topeka Hayden for the first round of the playoffs. District 3 – Burlington has already clinched the championship with wins over Iola and Girard. Iola will travel to Girard on Thursday night with the winner advancing to the playoffs as the district runner-up. District 4 – Frontenac has clinched the district championship with wins over Parsons and Columbus. Iola will travel to Girard on Thursday night with the winner advancing to the playoffs as the district runner-up. District 5 – Nickerson is the district champion with wins over Wichita Trinity and Wichita Collegiate. Trinity will travel to Collegiate this week with the winner advancing to the playoffs as the district runner-up. Wichita Trinity is seeking the first playoff berth in school history. District 6 – Smoky Valley will travel to Clay Center to decide the District 6 championship. The winner advances to the playoffs and gets a first-round home game, while the loser of this game goes on the road to Nickerson in the first round. District 7 – Scott City has clinched a playoff spot as the Beavers can finish no lower than one of the top two teams in the district. The Beavers travel to Concordia this week. A Concordia win coupled by a Goodland win over Colby would give the Panthers the district crown. Colby can obtain a playoff spot with a at least a 7-point victory over Goodland. Goodland can still reach the playoffs with at least 10-point victory over Colby and a Concordia loss to Scott City. District 8 – Holcomb has already clinched the District 8 championship with victories over Kingman and defending-champion Pratt in the past two weeks. Pratt travels to Kingman this week with the winner advancing as the district runner-up.